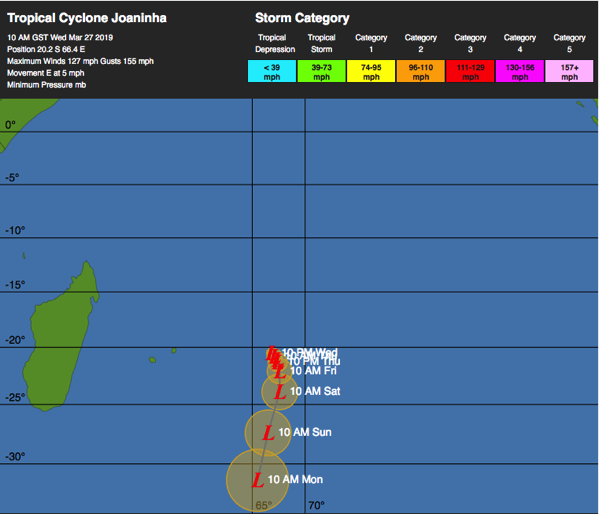 In the Southern Hemisphere: Tropical cyclone 22s (Joaninha), located approximately 171 nm east of Port Mathurin, Mauritius, is tracking eastward at 05 knots. 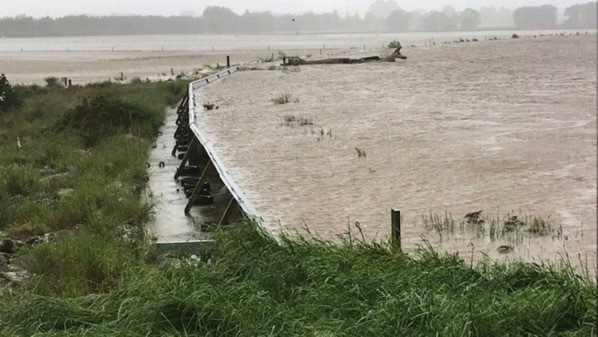 New Zealand – A woman has been found dead in New Zealand following a severe downpour that washed away a bridge and prompted a state of emergency in the South Island. 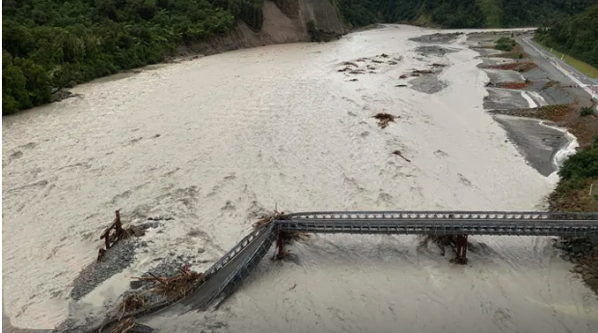 A storm battering the region saw the Waiho Bridge, near the town of Franz Josef, destroyed by a torrential river on Tuesday night. Meteorologists have described the event as significant, even by the area’s rainy standards, with some parts struck by more than 800mm of rain in a once-in-a-century downpour. Indonesia – Update – The Indonesian Red Cross is continuing search and rescue efforts in the wake of devastating floods that killed at least 113 people in the eastern province of Papua, with almost 100 still missing more than a week after the disaster struck. More than 11,500 people were displaced in flash floods and a subsequent landslide in the Sentani area of the provincial capital, Jayapura, earlier this month. As many as 94 people remain missing. 7.0 earthquake hits southern Peru. 5.8 earthquake hits the Macquarie Island region. 5.5 earthquake hits Santiago del Estero, Argentina. 5.1 earthquake hits off the east coast of North Island, New Zealand. As firefighters battle a blaze in the Nelson-Tasman region which has seen about 170 homes evacuated and a state of emergency declared, another fire broke out on Rabbit Island, across from Nelson Airport. Plumes of smoke had been rising from the island, directly north of Appleby and Wakefield, where evacuees have gathered. Residents had been asked to evacuate the area and Rough Island immediately. Residents of nearby Eves Valley and surrounding areas have been told to leave their homes. A state of emergency has been declared in the southern regions of La Araucanía, Biobío and Los Ríos, as a result of the forest fires that are devastating those areas. More than 8,000 hectares of forests and pastures have already been burned by flames, dozens of homes have been destroyed and hundreds of people evacuated, according to reports. Chile faces a complicated and unusual situation, because in the normally hot north, the so-called altiplanic winter has caused flooding and flooding of numerous rivers, resulting in three deaths and a girl missing. In contrast, in the south of the territory, usually cold even in the summer, high temperatures have set historical records. A number of serious bushfires are burning across Tasmania, with firefighters from NSW and New Zealand flying in to assist with efforts. The Miena community is being evacuated as more than 6500 hectares of bush burns at the Great Pine Tier in the Central Plateau. Tasmania Fire Service said the fire is very difficult to control, warning burning embers will threaten homes before the main fire. A blaze started by an explosion set off on a Bay of Islands beach has swept through part of a historic reserve known for its large kiwi population. The fire started just before 9pm on Saturday at Rangihoua Bay, on the Purerua Peninsula, and quickly spread up a steep hillside in Rangihoua Heritage Park. Some witnesses believed the explosion was caused by a petrol bomb, others that the device was made from a large quantity of fireworks. Firefighters described it as a home-made incendiary device. The most upsetting thing was hearing the sound of kiwi’s screaming from the burning hillside. 6.3 earthquake hits the Iran-Iraq border region. 5.6 earthquake hits the Caribbean Sea. 5.6 earthquake hits the Taiwan Strait. Two 5.2 earthquakes hit the Iran-Iraq border region. 5.0 earthquake hits the Iran-Iraq border region. 5.0 earthquake hits northern Xinjiang, China. 5.0 earthquake hits off the west coast of South Island, New Zealand. 6.1 earthquake hits the Caribbean Sea. 5.8 earthquake hits off the west coast of South Island, New Zealand. 5.3 earthquake hits eastern New Guinea, Papua New Guinea. 5.1 earthquake hits Trujillo, Venezuela. In the Western Pacific Ocean: Tropical Depression 33w (Thirty-three), located approximately 215 nm south-southeast of Manila, Philippines, is tracking west-southwestward at 17 knots. Tropical depression 34w (Man-Yi), located approximately 31 nm north-northwest of Puluwat, is tracking west-northwestward at 20 knots. In the Indian Ocean: Tropical depression 32w (Toraji), located approximately 74 nm southeast of Phuket, Thailand, is tracking west-southwestward at 20 knots. New Zealand – Floods and snow are hitting the South Island, as winter returns to New Zealand. The Otago Region Council has opened the Riverside spillway gates on the Taieri River at Outram, while in Dunedin the Leith River was in flood and residents were advised to stay off the roads. In the Southern Hemisphere: Tropical cyclone 03s (Alcide), located approximately 542 nm north-northwest of Port Louis, Mauritius, is tracking southwestward at 06 knots. South Island, New Zealand – A wet and wild weather system has bashed the West Coast, forcing the closure of schools, roads and potentially standing students for the night. 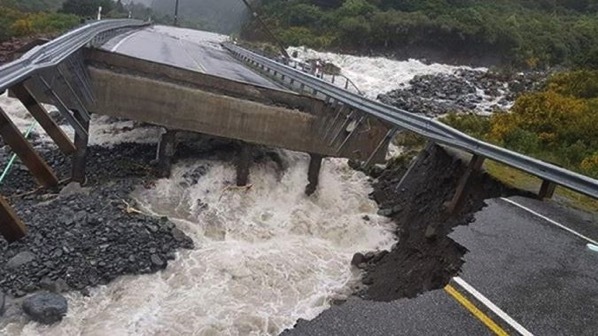 Meanwhile, a bridge near Arthur’s Pass has been swept away by floodwater. One person is believed to have fallen into a river and remains missing. Hokitika received more than 800 lightning strikes in a 20-minute period. 5.3 earthquake hits southern Xinjiang, China. 5.0 earthquake hits east of North Island, New Zealand. A massive quake of magnitude 8.2 struck in the Pacific Ocean close to Fiji and Tonga on Sunday but it was so deep that it did not cause any damage, authorities in Fiji said. The US Tsunami Warning Center also said the quake was too deep to cause a tsunami. The quake’s depth at 560 km would have dampened the shaking at the surface. 6.2 earthquake hits the Lombok region, Indonesia. 5.8 earthquake hits the Volcano Islands off Japan. 5.6 earthquake hits the Panama-Colombia border. Three 5.4 earthquakes hit Fiji. 5.4 earthquake hits the Kermedec Islands, New Zealand. 5.2 earthquake hits the Lombok region, Indonesia. 5.0 earthquake hits South Island, New Zealand. 6.0 earthquake hits Kepulauan Tanimbar, Indonesia. 5.5 earthquake hits east of North Island, New Zealand. 5.3 earthquake hits the island of Hawaii, Hawaii. 5.2 earthquake hits southern Qinghai, China. 5.0 earthquake hits South East of the Loyalty Islands. 5.7 earthquake hits the south-west Indian Ridge. 5.4 earthquake hits North Island, New Zealand. 5.3 earthquake hits the south-west Indian Ridge. Two 5.2 earthquakes hit the south-west Indian Ridge. 5.2 earthquake hits north of Ascension Island. 5.1 earthquake hits the south-west Indian Ridge. 5.1 earthquake hits Mindanao, Philippines.